There might be millions of ideas that can save a dress from not joining the department of old fashioned and if you’ve tried enough of the possible ways to keep the dress trending yet classy but failed to refrain it from moving out of your radar? then following the sleeves theory may help your dress stay alive for a good time. According to the theory of sleeves, sleeves of many kinds may manifest in the future based on the trends and comfort but what kind of sleeves work on what matters the most as sleeves can either make or break your total look. So choose your sleeves cleverly and here are some trending sleeve types ready to join your wish list to give you that additional moment of attention from the world. Flared sleeves are truly taking the most fashionable places like red carpets and launches these days for the blooming out and voluminous sleeve look it delivers. Look how Deepika Padukone has wrapped it and made the look way more stylish and unique. Alongside check her bell sleeves too in the pic2. In no time Roll up sleeves have got immense craze from people of different walks of life, everyone here and there are flaunting their roll up sleeves which has likely become a proud element of the attire. Royalty is towards your way and lot closer to you with the leg of mutton sleeve patterns that were born with the efficiency of showing any attire classically chic and distinct. Irrespective of the generations and trends, puff sleeves always tops the list of cuteness pouring sleeves and have you ever wondered how a simple puff sleeved blouse could able to change the entire game of your fashion? Do you know what the best part of Raglan sleeves is? they give the dress a complete official look but take no credits. They are simple, subtle and trendy. We have already doused in the shine spattered out from the season of Diwali and what creating a gap is what to wear on this colorful festival. Need some inspiration to work out with ethnic wear beautifully like never before? Then here is a compilation of ethnic wear inspired from Bollywood celebs for Diwali. Saree is the most sought after choice of any lady when a festival is round the corner. As this season has all come up with a lot of collection to get wrapped with, go experimental and adopt the oomph of trying unconventional and dazzling to shine under lights. Sonam Kapoor in Rahul Mishra saree strewn the shades of getting decked up perfectly for the festival and Jacqueline in Anamika Khanna creation melts with the soothing hues. Every girl’s obsession of looking fantastic can’t go down the line if she is in a lehenga of rich color alongside the complementary jewellery. The three piece lehenga incurs magic in precious moments and is an exact delight driving ensemble in any festival and for the festival of lights it is a total yes as it won’t go unnoticed. Dia Mirza in Shantanu and Nikhil lehenga, made a game of win win with lot of head turns while Alia Bhatt crushed us deep down with her red hot lehange designed by Manish Malhotra. A busy women’s fashion kit has to be filled with an anarkali or two in this festive season if shining like a light is a target you want to achieve in this Diwali. Get the floor length heavy embroidered anarkali and pamper the glow permeated all around the way. And the Bollywood celebs made it to a top point of pulling craze by dazzling in designer creations. Deepika Padukone in Anju Modi anarkali and Sonam Kapoor in Gaurang Shah’s collection soothe senses with the vibe of fashion. The epic love story based film Bajirao Mastani which is set to permeate the world within two months has brought a glimpse of story with its trailer and we all went gasped with the grandeur and royalty wafted from it since the film pertains to centuries back love story of peshwa and warrior princess – the characters which are being portrayed by Ranveer Singh and Deepika Padukone. Ranveer Singh will appear as peshwa while Deepika Padukone creates treat to eyes with her mastani named warrior princess role. 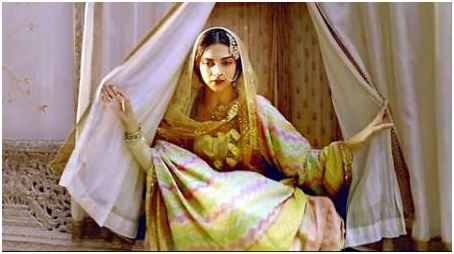 Dressed up in Anju Modi’s designer costumes, graceful Deepika has already reinstated life to the mastani role and is giving tough waiting hours to get the most of her look. According to sources, for designer Anju Modi, designing mastani costumes isn’t an errand as there are no much references for her to construct styles apart from only one source of image that the team had in their research. Based on the single image, Anju Modi created looks of Deepika that are clear in-detail when it comes to costumes, jewellery and other accessories. “We’ve added many muslim ghararas and shararas to the mastani character to get the authentic vibe of the character” said the designer. 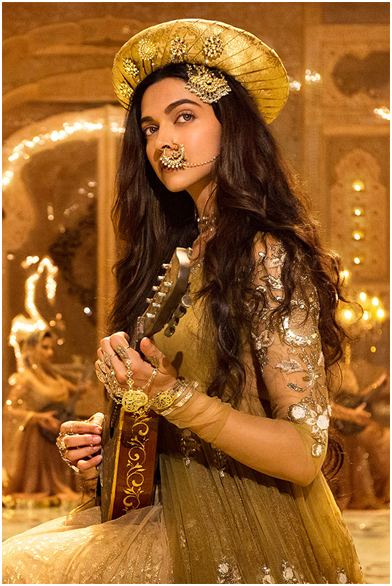 Mastani is a brave and courageous warrior princess and her costumes to nose ring to mandolin to turban, everything speaks about her uniqueness and the royalty that women carry during previous centuries. Flaunt your legs in a way like never before by leveraging printed pants that are scoring points now-a-days with their perfectly quirky designs. Without keeping a bay for people with different body types, these printed pants are setting alarms for the newest trends and have become fashionable while giving funky look. Floral, geometric, animal prints, horizontal stripes, tie-dyed prints or polka dots whatever could be the choice, glam is for sure and so celebrities are no far from wrapping themselves in those stylized looks. If strutting in traditional ensembles is Madhuri’s stereotype route then she might have opted for a new one. During her attendance at Farah Khan’s 50th birthday party she was all seen in a new avatar: Graphic printed pants, black tank top and a white blazer. One of her visits to airports, Priyanka dressed in printed pants alongside a striped top and a leather jacket. Seems like the long legs beauty is fond of printed pants. Not once or twice but many a times, the Tamasha actress rocked her looks through comfortable and chic driving printed pants. For the Finding Fanny audio launch, Deepika paired up a peach lace top with ripped floral printed pants and at ‘Yeh ‘ promotional rounds she was in tie-dyed printed pants. Soha Ali Khan made her fashion statement with a pair of printed tees two years ago. At a launch event in Delhi, Soha teamed printed pants with a white sleeveless top and black peep toe pumps. Shraddha Kapoor during a launch event of Forever 21 Inc in Mumbai wrapped in printed pants and quilted vest. With this trendy look the Aashiqui girl proved that she is not confined to traditional wear but can hold the beauty of trends too. Grow those flowers of style in your wardrobe with the desire of adopting the floral fashion blossoming smoothly at roads and ramps with a touch of classic look. 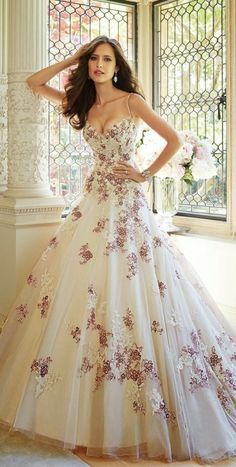 Appears all the day fresh, design of floral never fades even at the dawn of the dusk where as going viral through its mist of storing colorful flowers from little to big and has made an indelible mark in the book of fashion. With its roots all over the globe, floral poured the power of turning any age to chic. Whether you look into Hollywood or Bollywood, celebs are seen rocking these florals in gatherings, promotional activities, evening parties and many other events. 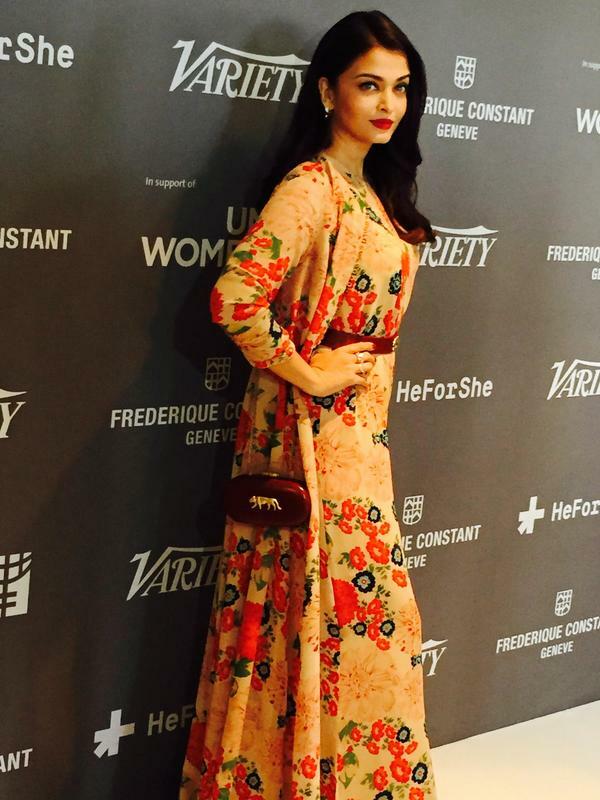 If you remember the strapless floral dress don by fashion girl Sonam Kapoor at the Cannes Film Festival in 2013, floral jumpsuit wrapped by Aishwarya Rai Bachchan during a Cannes event and Zara floral-print blazer worn by Deepika Padukone during promotional rounds for her upcoming film, it’s so easy to get to the point of how well the floral designs are working in every floor. 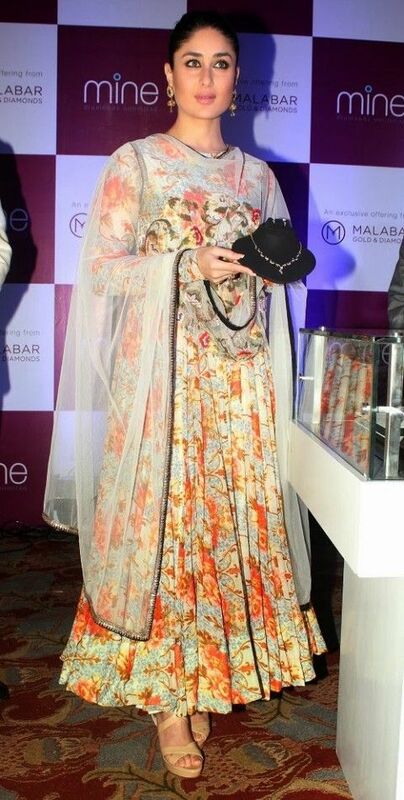 Joined the celebs celebrating in floral designs, Kareena Kapoor doubled the floral elegance during her presence at a Malabar Gold press conference while the “Bombay Velvet” beauty Anushka Sharma spilled the magic of flowers through her floral printed off-shoulder maxi dress during her attendance at the movie promotion. Never looked back since she fueled wheels of her debut film ‘Om Shanti Om’, the long legs actress ‘Deepika Padukone’ is a fashion diva who caught the pulse of style from almost all modes. She never confined to a single scoop of style where as the fashion lady often left people gasped as she could bring any attire a curve that she can fit in. Getting ready to show us some ‘Tamasha’ in future alongside Ranbir Kapoor, Deepika might have her closet tight with variety of outfits but amongst those dresses which created buzz, her black and white ensembles sure packed a big part. This full sleeves encompassing knee length black and white dress has flaunted a unique style of Deepika. Turned heads in London while promoting her one of the biggest blockbusters ‘Chennai Express’ Deepika rocked it. Keep aside those words spitted by Raki Sawanth, consisting Zebra that relating to the black and white full length stripes gown worn by Deepika Padukone at Big Star Entertainment Awards Function, just because we loved it! This full length one shoulder dress designed by Naeem Khan not just enthralled all kinds of fashion lovers but inspired us too. 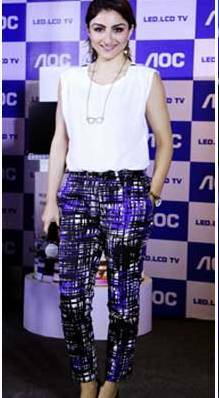 During a recent event launch, Deepika was all on stripes, she wore a black and white outfit in which she was quite flattering and great. Teamed up her dress with over-sized glasses and blue footwear, the beauty looked more beautiful.